I love everything Anthropologie. I recently decided to take the plunge and purchase some items online for our guest bathroom [which I have been re-decorating in my head for months]. Like two of our bedrooms, the bathroom also has a dreaded border that I will have to take down before tackling the wall color. I’m 98% sure I’m going with a light grey paint color [I’m currently leaning toward Cathedral Grey by Behr; they have a fantastic website where you can upload a photo of your room and actually preview different paint colors on your walls]. 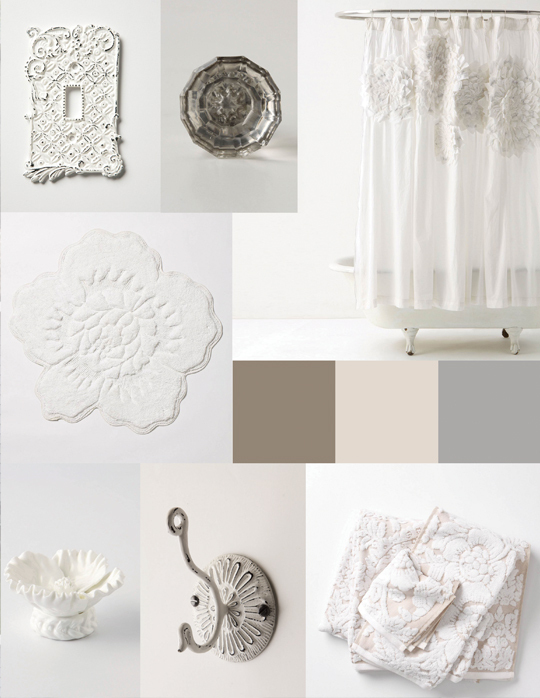 Lately this blog has me loving grey like never before, and I think it will look great in contrast with our white moulding. Everything else will be shades of white and tan. I can’t wait to get started and see this gorgeous shower curtain in action, as well as the pretty floral bathmat and towels. There are about 17 other things on my wish list, including some vintage looking drawer pulls that I LOVE, but I’ll be taking several trips to the thrift and antique shops before I make any decisions on the details. LOVE it. You’ve in turn inspired ME I may need your assistance in creating some mood boards of my own, dearie…it’s about time I start sprucing up my home space! Thanks! The towels and bath mat arrived yesterday and I’m in love! They’re so soft and pretty.